Bill Meyer — the consummate Westport volunteer, a man who knew everyone in town, and one of the most genuinely friendly human beings on the planet — died today. He battled multiple myeloma for over a year. In his 85 years, Bill did more than 85 normal people could in 85 lifetimes. Professionally, he had a fulfilling career as national sales manager for several companies. “We manufactured and sold pens and pencils,” he said of one business. That’s like saying Bruce Springsteen “plays music.” In fact, Bill managed 800 workers on a Blackfoot Indian reservation in Montana. He was so motivational and inspirational, the tribe adopted him — and gave him an honorary Indian name. But as much as he traveled, Bill always found time for Westport. received the YMCA’s Faces of Achievement honor. Bill loved Staples. He loved Westport, sports, the theater, church, the Republican party, volunteering, old people, young people, and his wife Carolyn. Or — to put it another way: Bill loved life. We owe Bill Meyer an enormous debt. He touched each of us, and all of us. He made Westport a better place to live. You can’t ask for a better life than that. This photo epitomizes Bill Meyer. 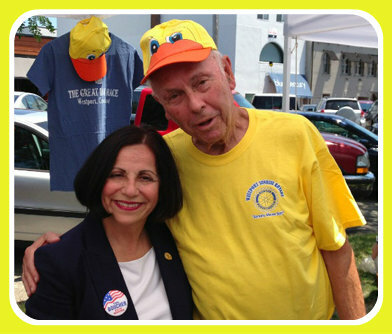 He was volunteering at the Great Duck Race, sponsored by Sunrise Rotary, while hugging Republican State Senator Toni Boucher. This entry was posted in Local politics, Organizations, People, religion, Staples HS and tagged Bill Meyer, RTM, Saugatuck Congregational Church, Westport Community Theater, Westport Sunrise Rotary Club. Bookmark the permalink. I had the great pleasure of working with Bill Meyers through PAL Cheerleading Organization. What a class act. His energy and his excitement for all things was so inspirational. He will surely be missed by so many who had the honor of working with him. Thanks, Bill for always sharing your smiles with us all! Bill was the first person to greet me at Saugatuck Congregational Church almost twelve years ago. He did so with his characteristic warm handshake and big smile. He was a good friend to so many. Bill’s optimism and warmth were genuine. His cup wasn’t half full – it overflowed. He will be missed and fondly remembered. Bill, you are my hero! God bless! Yes, I will publish info when I hear. Thanks. Bill wasn’t someone you encountered, he was someone you experienced. Thanks for all of the lessons, neighbor.. RIP. What an amazing man. He did so much for Westport with such passion, energy and spirit that never waned. He will surely be missed. Prayers to his family. Bill was my daughters softball coach in the late 80’s and gave them a great experience and so much confidence. He did so much for our town and will be sorely missed. RIP Bill. The best way we can pass on his legacy is to get and stay involved. As his light went out if the hundreds of us can turn on our lights, he will be smiling and fist punching everyone in heaven. Watch out St. Peter! RIP, Bill! An unending cheerleader for our great schools He was a true gentleman and fantastic Westporter through and through! Thank you, Mark. Nicely done. So sorry to learn about Bill. I remember him from my children’s softball years. He was truly a delightful man. Bill’s caring, enthusiastic omnipresence will continue through all of us, There can only be one Bill Meyer and I’m so glad he was Westport’s ever-ready bunny, he did more in an hour for others than most do in a week or a month. One Bill story: late June 2010, Field of Flags on the great lawn of Saugatuck Congregational Church, Bill, was not only part of the organizing team, but also spent 6 hours in front of the microphone calling up each local group to place their flags, introducing speakers and giving comments with his usual grace & charm. My thoughts and prayers to Caroline and his family. My whole family is mourning his loss. He was my friend and my colleague and also the #1 supporter of my daughter in Softball. He came to games just to watch her play and cheer her on. And I have the honor of being his last recruit into the Sunrise Rotary, I think I am #35. As Charlie said, Watch out St. Peter, Bill is coming and is going to shake things up. Our best to Carolyn, Mark and Bill’s daughter. I can still hear Bill calling balls and strikes at my son’s baseball games. A real gentleman. He will be missed. Art and I got to know Bil through our participation in by activities sponsored the Y’s Men. We always looked forward to seeing him and he was always there! Words alone cant describe the affection and respect we had for him as a person – and the awe we sometimes felt when he told us about yet another role or organization he was and had been involved in. What a life! We will miss him. Bill will be missed by all. He was a pillar in our community and endeavored to work for a better Westport. My thoughts and prayers are with his family and friends at this difficult time. When I first applied for membership to the Y’s Men for I was refused because I was then living in Wilton – Someone referred me to Bill – I called and he called back the same day – He asked me about my contributions to the Westport community during the years I lived in Town and all of a sudden I was accepted – and from that day on he was always the first person I sought out at the Thursday meetings to say hello and thanks for listening. 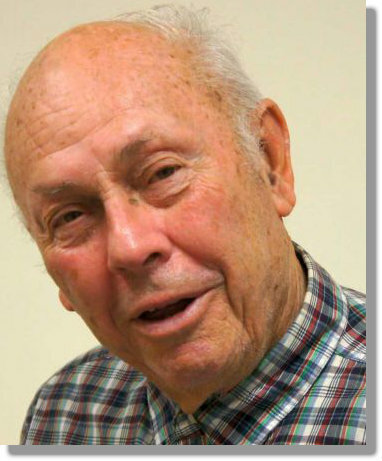 Bill Meyer was Westport’s Ambassador to everything that is and was WESTPORT, CT. If it needed to get done for the betterment of Westport, Bill was involved. Thank you Bill for all you have done, especially for All of your work and dedication to Girls Softball!! So many Girls benefitted from your efforts!! Enjoy a super, super day Westport, thanks to Bill Meyer! !